The Times Free Press has two unique editorial voices: The Chattanooga Times, representing the liberal view, and the Chattanooga Free Press, representing the conservative view. The best reason to vote for Hillary Clinton is not the myriad weaknesses of her opponent. Rather, it is she. Let's be specific. It is the compilation of her strengths — her experience, but perhaps most importantly her heart. Something she said years ago that has remained in our collective psyche is universally comforting still: "It takes a village" to raise a child. Similarly now, she reminds us that it takes us all "stronger together" to nurture a country. Those of us who value country. Those who value people. It does not take ideology. It does not take a brand. It does not take party, nor a single religion, or a single race or gender. And when you separate from us the fringe naysayers, we know we need a unifier. Someone with focus. We know we need a person who speaks to our mom and dad instincts. Hillary Clinton is not perfect. Nor is her family, or her campaigners or even her ordinary citizen supporters. But Clinton knows the weave of balance, cooperation and compromise. She's a great listener, a well-prepared planner and executive. She's known for working hard and for getting things done. She has shaped coalitions, hammered out agreements, built consensus. She has already been the mom and traffic cop and moral glue of accomplishing much in public service over her lifetime. "I sweat the details of policy — whether we're talking about the exact level of lead in the drinking water in Flint, Mich., the number of mental health facilities in Iowa, or the cost of your prescription drugs. Because it's not just a detail if it's your kid — if it's your family. It's a big deal. And it should be a big deal to your president," she said when she became the Democratic presidential nominee in July. During that convention, President Barack Obama, as one two-term president to another two-term president (and the world) said: "There has never been a man or a woman — not me, not Bill [Clinton], nobody — more qualified than Hillary Clinton to serve as president of the United States of America." Yeah. She's been a poor-people's advocate, a wife, a mother. She's stood as the wife of a governor and the wife of a president while policy was sliced and diced. She's served as a senator from New York, and twice a presidential candidate. She mended fences with an presidential opponent to become a secretary of state negotiating with foreign governments in a time when we were re-understanding foreign policy as post-2001 terroristic global realities began to emerge. But governing qualifications aside, Hillary Clinton represents Middle America as a champion of middle class values with proposals for equalizing the tax codes, raising the minimum wage, reining in Wall Street, furthering affordable health care, guiding us to sensible gun rules, improving education and keeping us safe in an ever-more-complex world. But of course there is more. There is that opponent who, in today's America, stands like a beacon of darkness — even to the Republican Party that created him and now has lost its soul to a base that seems star-struck by its reality TV king, Donald Trump. In this landscape, Hillary Clinton is the only choice. Not just for moderate and pragmatic Democrats, but also for moderate and pragmatic Republicans who don't understand why the GOP no longer looks or sounds like the party of Ronald Reagan they once knew and loved — the party of Tennessee's Howard Baker, who was known as the great conciliator. As Clinton rightly and often says, she can get things done. She understands the art of civil conversation, negotiation and compromise. Her opponent and his ghostwriter crassly called it the art of the deal. Clinton understands that leadership requires wins for the people — not just the profiteer. "I am not interested in ideas that sound good on paper but will never make it in real life," Clinton said in a recent Iowa campaign speech. That means, among other things, that she is someone who can keep what President Obama got right, and fix what he didn't get right — such as health care, immigration reform and gun safety. Is she tough enough? Does she have stamina? Well, rather than being married three times, bankrupting businesses six times and leaving countless Americans unpaid each time as her opponent has, Hillary Clinton is still married to her first husband. She has traveled to 112 countries and negotiated a peace deal, a cease fire, a release of dissidents and opened new opportunities in nations around the world. She's seen the slings, arrows and pain of political life. And thanks, in part, to her brilliant but flawed husband's time in the White House, she is accustomed to being a target. Thus she followed advice of Colin Powell to protect her emails. She has since acknowledged and apologized for the mistakes of using a personal account and server in much the same way that Powell, Ash Carter, Condoleezza Rice and other officials did. They were not investigated multiple times as she has been — likely because they never professed political aspirations opposing the GOP. Benghazi? The multiple Republican witch hunts that followed that sad tragedy served only to further injure America's perception of congressional dysfunction and to offer Clinton greater opportunity to appear presidential. Clinton is both strong and committed to serve. She has education, experience, temperament, grace, intellect — and yes, she has trustworthiness, in spite of the vulnerabilities left to her from world affairs while she was secretary of state. In contrast, how could anyone possibly find Donald Trump trustworthy? Earlier in the campaign season, he looked straight into a television camera and suggested Russian hackers find 33,000 Hillary Clinton emails that he falsely claimed were missing. These emails aren't missing. Most were the personal email that the State Department told Clinton she should delete before she turned over more than 30,000 work-related emails to be archived. FBI investigators, years later tasked with rechecking her, said they found those deleted emails on her server after she was asked to surrender it and she did. FBI Director James Comey said there is no evidence these emails, recovered from the server, were deleted in an attempt to conceal information. He did say using the personal email address and server was "extremely careless." But he also said there was no evidence she had intentionally transmitted or willfully mishandled classified information. And later in sworn testimony to Congress, he said none of Clinton's emails were properly marked classified, and a person with expertise would have reasonably inferred they were not classified. The GOP's oft-reported and infamous "C" was in the body, in the text, "but there was no header on the e-mail or the text," he said. On cross-examination, he said Clinton would and should have had a "reasonable inference" from the absence of a "classified" header that the three documents in question were not classified. Yet Donald Trump — a man who professes to admire Russian leader Vladimir Putin and whose son says he has financial ties to Russia — has publicly asked Russia, an enemy country, to spy on Clinton, a lifelong public servant and his opponent. And that's not a scandal in GOP-world? Go figure. 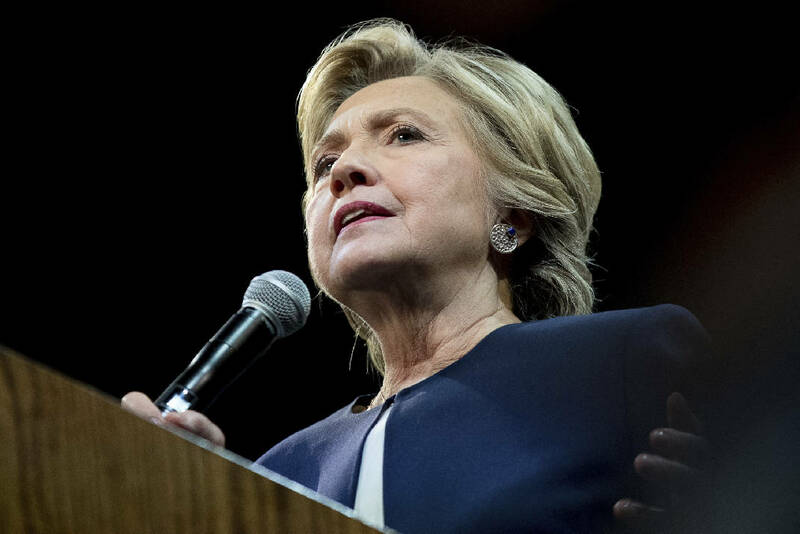 Also in this vindictive and silly political season, voters have repeatedly been bombarded with Republican claims that Hillary Clinton has "trust issues." Clearly the real trust issues should be with the 10 congressional committees Republicans have involved in the multiple and unnecessary congressional investigations of her. None of those investigations, by the way, including the one that resulted in her 11-hour testimony, have resulted in anything other than the useless expenditure of our taxpayer money — nearly $30 million to date. And then there is the simple evil of Donald Trump and the GOP. Long before Republicans began running from Donald Trump, they created the fear-mongering, right-wing, echo-chamber, obstructionist culture that let Donald Trump win the GOP nomination. The difference today between Trump and Clinton is the stark contrast between dark fear and the simple audacity of hope. Trump thunders that our streets teem with alien danger, terrorist threats and empty factories. And with characteristic Trump ego, he asserts that only he can fix it — and "make America great again." Clinton rightly notes that if Donald worries about idled factories, perhaps he should have his Trump ties made here rather than in China, and his suits made here rather than in Mexico. Perhaps Trump furniture should be made in America rather than in Turkey, and Trump picture frames might best be made in the United States rather than in India. And putting aside all of Trump's horrendous flaws of sexism and bigotry as well as foreign policy ignorance that borders on traitorism, there is his simple lack of honest patriotism and love of humanity. He may be adept at getting buildings erected, but he clearly has little understanding about how to grow a community — any community, let alone a country. "None of us can raise a family, build a business, heal a community or lift a country totally alone. America needs every one of us to lend our energy, our talents, our ambition to making our nation better and stronger," Clinton has said. "That's why 'Stronger Together' is not just a lesson from our history, not just a slogan for our campaign. "It's a guiding principle for the country we've always been and the future we're going to build — a country where the economy works for everyone, not just those at the top. Where you can get a good job and send your kids to a good school, no matter what ZIP code you live in. A country where all our children can dream, and those dreams are within reach. Where families are strong, communities are safe, and, yes, love trumps hate," she says. The best reason to vote for Hillary Clinton is her heart. And the wonderful, experienced mind she lends to it.